This month The Dollar Box looks at The Incredible Hulk #138 (April 1971) — a lost classic from Herb Trimpe and Roy Thomas! I have a confession to make. 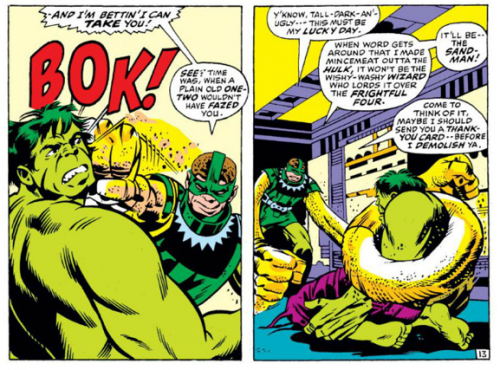 The Hulk is one of those Marvel heroes that I dearly love … but I’ve never been a fan of his Silver and Bronze Age comics. 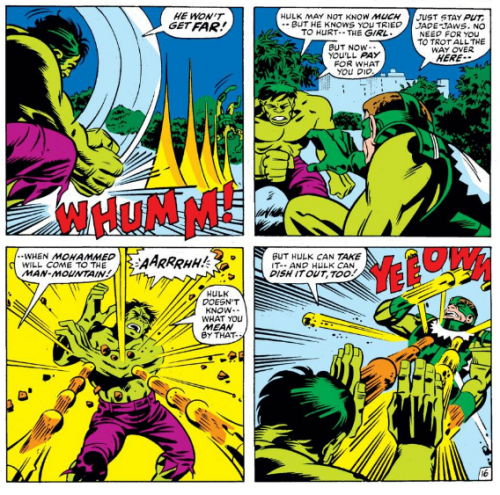 While I dutifully collected The Incredible Hulk for years, most of the time I preferred the Hulk’s guest appearances in other books to the monster-of-the-month/Hulk SMASH fare on offer in the Hulk’s own book. 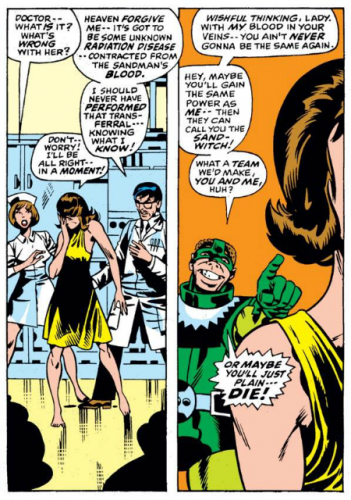 To be honest, most issues of The Incredible Hulk are forgettable. Incredible Hulk #138 is not one of those issues. Herb Trimpe isn’t my favorite Marvel artist (and I gave him short shrift when I reviewed his later Godzilla work over at Longbox Graveyard), but when revisiting Trimpe’s work it is important to place it in context. For much of his Marvel career, Trimpe was an inventory artist, paid a salary to draw a certain number of pages a month, sometimes as the regular penciler on a book, and other times pitching in wherever needed — and much of Trimpe’s work from this era is of an assembly-line quality. But that doesn’t mean Trimpe wasn’t a fine artist, and when he had the inclination (or possibly just had the time!) he could produce some stand-out storytelling. 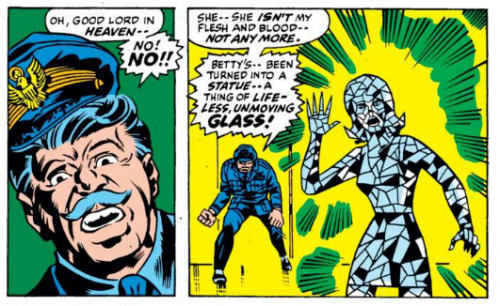 spoiler — Betty gets turned into a glass statue! … but it is the style in which this story is told which makes it worth revisiting, all these decades later. Trimpe follows-up his cover with a full-page sequence showing a mournful Hulk changing back into Bruce Banner. 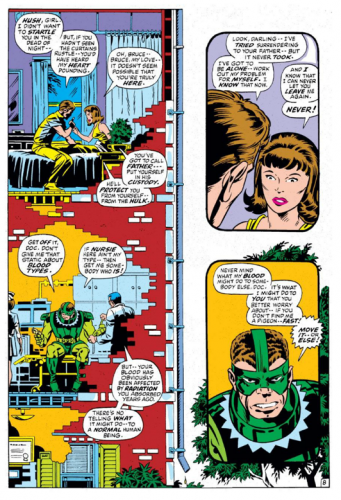 Writer Roy Thomas must have been inspired to stretch himself a bit, as well, juxtaposing The Sorrow of Love by William Butler Yeats with Trimpe’s panels (similar to the way he disposed of Ultron by way of Percy Bysshe Shelley’s Ozymandias at the conclusion of Avengers #58). Thomas’ literary bent continues in the way he handles The Sandman. 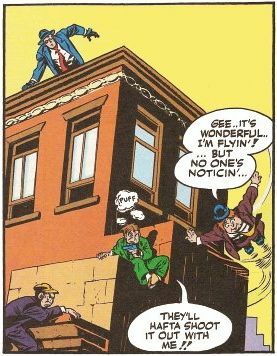 Our villain is familiar enough at first, though readers expecting the striped-shirt Sandman of Amazing Spider-Man fame may need a moment to recognize the disguised Sandman, who is sporting his Masters of Evil costume. Thomas’ characterization of Sandman is especially good. Our bad guy is desperate for a blood transfusion to get rid of that glass hand that he’s sporting, and he’s not afraid to hurt people to get what he wants. 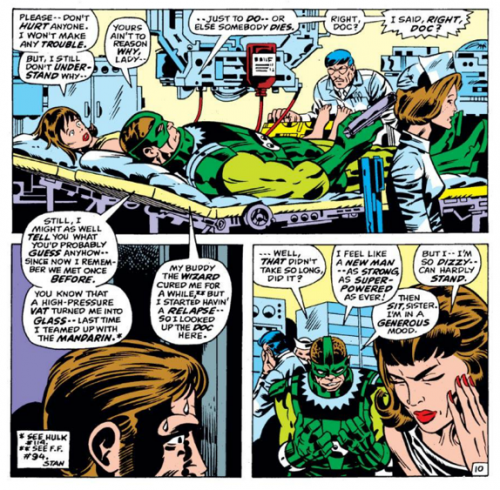 But no sooner is Sandman getting his transfusion (which in the fashion of a convenient Silver Age coincidence, is coerced out of Bruce Banner’s gal, Betty Ross) than Sandman is quoting … The Charge of the Light Brigade from Alfred Lord Tennyson? 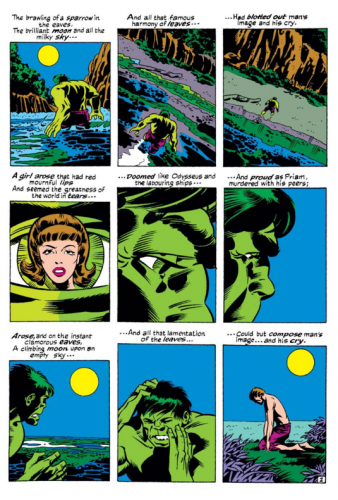 This sequence also shows a subtle bit of comics artistry by Trimpe & Thomas — though it is impossible to judge if it was intentional or just a byproduct of ballooning the page — as the story manages a seamless, tension-building cutaway by overlapping the Sandman’s monologue with a stressed-out Bruce Banner silently watching the scene unfold from hiding. … or the full-page shot which follows (in which I detect further Eisner influence) using the geometry of the hospital and juxtaposed images of our characters to advance parallel storylines. … with the usual fist-opera consequences. Hey, this is the Hulk we’re talking about, after all. Sandman manages a Francis Bacon reference in the fight that follows but it’s otherwise the kind of thing we’ve seen before. Which shouldn’t obscure the quality of this exceptional issue, which bore a fifteen-cent cover price when it was published in 1971, but will today run you around ten bucks in “Fine” condition. That price is too rich for a book you’re likely to find in a genuine “dollar box,” but it is a steal for a superior story from this era — and it is a small price to pay for a renewed appreciation of Herb Trimpe’s talents, who deserves greater respect than I had given him (and definitely deserved better than he got from Marvel). Thanks as always to StashMyComics for hosting The Dollar Box! I will see you back here in a month for another comics treasure with an original cover price of a dollar or less, and in the meantime, please join me at my home blog — Longbox Graveyard — where I publish a new comic book column every Wednesday! A poem in a Hulk comic?! I always know I can count on Roy Thomas for a good Bronze Age tale. I like the lettering on that poem, also. Very nice art also. I love the page with the comic panels framed by the bricks of the hospital. I love that Thomas and Trimpe both put a little extra shine on this otherwise-forgettable assignment. It shows a real pride of craft and left us with an issue that is a diamond in the rough. 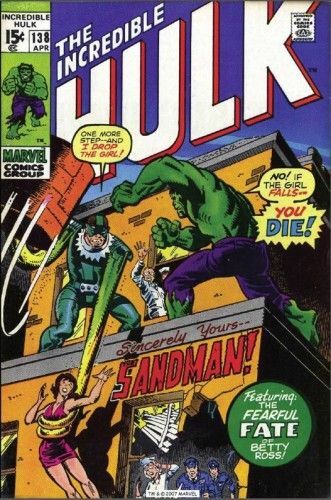 Just for the record, the Sandman’s costume in this issue was designed by Jack Kirby and introduced in Fantastic Four #61, wherein the Sandman, by then a long-standing member of the Frightful Four, took on the entire FF by himself for the first time. 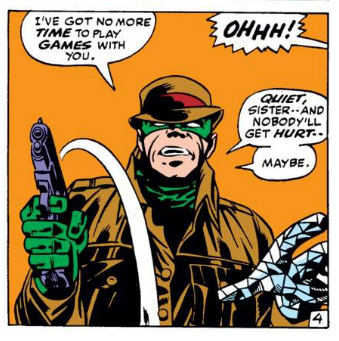 Sandy returned to his old Ditko get-up in the early ’70s.